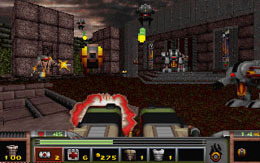 May 1996, a first person shooter computer game which was developed by Rogue Entertainment and published by Velocity for the DOS platform was released. 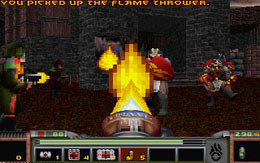 Having been based on the Doom Engine from id Software, Strife brought further role-playing game elements and allowed players to talk to other characters in the game's world. You can speak to non player characters and some of the decisions you make will have an effect on the future game play. Within the game there are also numerous paths to follow (for example, at one point the player can kill Macil -the rebel leader- , or decide to still trust him), this can result in one of 3 different endings (from what I’ve found). You travel from a middle hub-like area in the City between a variety of levels which will stay the same as when the player left them. The world is a wide-ranging environment, not divided into levels like most other 3D shooters of the time. Looks like twin BFG's while in castle Wolfenstein. 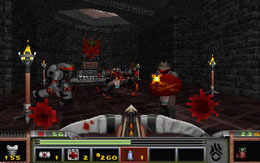 Even though the game brought many improvements to the Doom engine, it could not compete graphically with other games that were being released at that time, including id Software's Quake. Because this game had an actual plot, this was one of the few that I have had the patience to play from beginning to end. 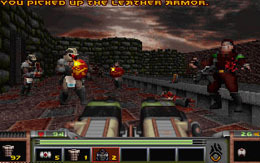 Some really amazing things were done with the good old Doom machine by the programmers. I liked that instead of the typical mission briefings, your objectives were relayed to you in-game either by people you talked to or by your omnipresent equal “Blackbird” on the radio. I feel that this aided in giving the game quite a smooth, rather seamless transition. I also liked that instead of a dead world populated by only monsters attempting to take your life, Strife had various "pleasant" areas such as two rebel bases as well as two towns where you could just mosey around and talk to people or buy things. Also, there was a great deal of diversity in regards to the levels (ranging from old ruins through to occupied towns) instead of the usual endless analogous corridors. My only real complaint was that the very last section of the game (the Factory) seemed a bit tacked on; as though it wasn’t as well thought out as the rest of the game. To me it was pretty much just a handful (5) of levels filled with repetitive shooting and button-hunting, with virtually none of the interactivity, creativity or even the atmosphere that made the rest of the game so undeniably wonderful. However once you reached the end of the Factory things did pick up, although that was reaching the end of the game. Is that a brown 2.5D Rubik's cube? Defeating the last boss may show two endings - one better (player decided to trust Macil earlier), where all the fighting stops, and the reconstruction of human civilization begins, and one worse (player decided to trust the Oracle), where The Order still exists, and there is diminutive hope for the survivors to hold on long enough for the situation to recover on its own. If you die during battle with the final boss, it will be able to acquire the entire Sigil, leading to the worst conclusion, in which humanity is wiped out. This conclusion is also shown if the game is beaten by using a cheat to warp to the final level. On the whole I found Strife to be a pretty fun game and is definitely worth a play if what you are wanting is a Doom-like first person shooter that contains a little more substance than ‘run around and blast the crap out of everything.’ While the missions are engaging, I found that sometimes the reckoning behind them is quite indistinguishable at times. The missions range from pilfering, assassination all the way to sabotage. I feel that they do a reasonably good job of varying the game play. So far so good, I have played this game through around 5 times and have yet to remove it. In conclusion: A truly innovative game which never caught on due to a somewhat outdated engine.